With Madhya Pradesh voting today to elect a new government, both the BJP and the Congress’ campaign advertisements have one thing in common: placing women voters at the centre of the political rhetoric. Promising protection against sexual harassment, free sanitary napkins to promote health, and scooty for college going girls, the campaign focus on health, safety and education – traditionally considered ‘soft issues’ important to women – suggests that the politics of appealing to women voters remains clearly gendered. But speaking with women voters across rural Madhya Pradesh paints a more nuanced picture. 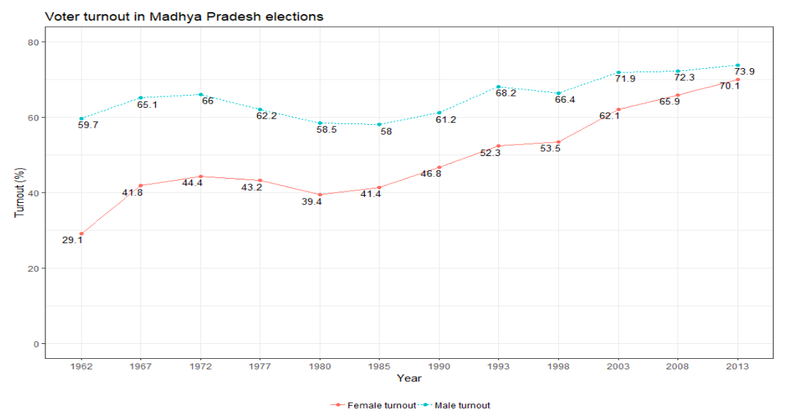 Over the last two decades, data shows that women have increasingly turned out to vote in state and national elections, leading justifiably to a scramble among political parties to gain the “female vote”. Yet in this frenetic milieu of noisy campaigns, have political parties rightly understood what women want from the state, and is this different from what men want? Although the Congress’ promise of free sanitary napkins sounds appealing to Anvita*, a rural woman from the Dhakar samaj in Sarsi village in Madhya Pradesh, it has little resonance for her. Preferring to use the trusted cotton cloth during her period, she tells us, “Pad ko bahar fenkna padta hai… Bahar jo gai ghoomti hai woh usse kha sakti hai, isse hamein paap lagta hai (we have to dispose off the napkins outside, where it can be consumed by our cow. This means we have sinned)”. The BJP’s flagship scheme, Ujjwala, which makes provisions for subsidised cooking gas cylinders in a bid to ameliorate women’s health and ease their burden of collecting firewood, also seemed to have few takers in Madhya Pradesh. Citing the onerous paperwork, many women said they were unable to avail of the scheme. And even if they were able to put together the necessary documents, economic concerns took centre stage: “Agar documents hote, tab bhi cylinder refill karne ke paise kahaan se aate (Even if we had the documents, how would we be able to afford this?)”. From Chambal to Malwa, speaking with women voters across Madhya Pradesh revealed a fundamental disconnect between party perceptions and women voters’ expectations. On gender differences between policy preferences, women too, like men, articulate clearly that what they want from their government is greater economic opportunity, not napkins or cooking gas. Narrating the hardships her family faces while swiftly packing tobacco into beedis, Sabiha, a Muslim woman from Jabera, laments, “Ek hazar beedi ka Rs 90 milta ha, ab usse kya hota hai? Sarkar ko koi factory kholni chahiye taaki hum bhi kaam kar saken (for 1000 beedis, we get paid Rs 90, what good is that? Instead, what the government should do is set up a factory so we can work too)”. Similarly, women in Morena district, talking about the closure of the neighbouring sugar mill 15 years ago and the forced migration of men in search of work to Gujarat and Delhi, underlined the economic difficulties they had to face. When asked the one thing that government could do to help them, they said they wanted the mill to be reopened. As with the campaign rhetoric in Madhya Pradesh, the academic literature too fails to adequately emphasise women’s concerns about economic well-being. One exception to this is scholar Sarah Khan’s work in Faisalabad, Pakistan, where she finds that women care more about income support schemes than men. Despite aggregate evidence on the difference between men’s and women’s policy preferences in India still remaining mixed, what is clear is that women’s economic concerns deserve more serious consideration in both political and academic discourses. Anirvan Chowdhury is a PhD Candidate in Political Science at UC Berkeley, and Khushdeep Kaur Malhotra is a PhD candidate in Geography at Temple University, US.